A Pareto Chart is a chart, usually a vertical bar chart, in which each bar represents the number of occurrences of a particular type of event. The bars are arranged such that the most frequent type of event is shown at the left, then the next most frequent, and so on. 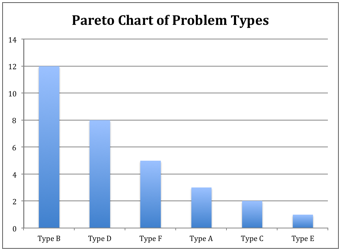 The Pareto Chart is useful for determining which types of events have the most significance due to their frequency. A tool suitable for helping to assess relative priorities.